WATCH: Candidate statements at Republican Debate in Las Vegas, Nevada, Dec. 15, 2015. Political fact checkers in the U.S. are finding that the 2016 Republican presidential candidates offered a new raft of dubious claims and just plain wrong statements at their latest debate. Fact checkers at The New York Times, The Washington Post and web-based Politico all weighed in with assessments that the Republican front-runner, real estate tycoon Donald Trump, and his two leading challengers, Texas Senator Ted Cruz and Florida Senator Marco Rubio, exaggerated claims about their opponents, President Barack Obama and recent U.S. national security issues during the debate Tuesday night. The news outlets also faulted statements by several other Republican contenders, including New Jersey Governor Chris Christie, former technology corporation executive Carly Fiorina and Kentucky Senator Rand Paul. The Times debunked Trump's broad claim that he opposed the unpopular U.S. war in Iraq, noting that he did not come out against it until 2004, a year after American ground forces had invaded. The Post knocked down Trump's statement that the al-Qaida airplane hijackers who launched the 2001 attacks in the U.S. sent their "friends, family, girlfriends" home to safety before crashing their jets into New York's World Trade Center and the Pentagon outside Washington. The newspaper noted that the comprehensive investigation of the attacks concluded that the hijackers had largely cut off contact with their families. 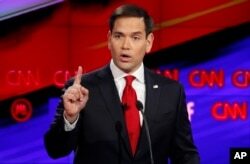 Marco Rubio makes a point during the CNN Republican presidential debate at the Venetian Hotel & Casino on Tuesday, Dec. 15, 2015, in Las Vegas. The Post also criticized Trump's claim that illegal immigrants "are pouring across the [U.S.] southern border" with Mexico, when in fact the flow of undocumented immigrants has fallen to its lowest point in at least two decades. The Post said both Cruz and Rubio misstated the changing provisions of U.S. telephone surveillance programs intended to intercept calls made by suspected terrorists plotting another attack on the U.S. The Times and Politico said Cruz erroneously stated that Obama toppled Egyptian President Hosni Mubarak in 2011, when he actually stepped down as the Egyptian people rallied against his rule. Christie claimed that if he is elected president, he would consult with Jordan's King Hussein, but the Times noted he could do that "only if he has a time machine," since Hussein died in 1999. Jordan is ruled by his son, King Abdullah II. 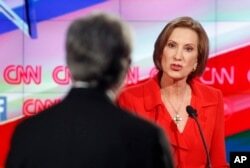 Carly Fiorina responds to debate moderator Wolf Blitzer during the CNN Republican presidential debate at the Venetian Hotel & Casino on Dec. 15, 2015, in Las Vegas. Fiorina said she would bring back to active duty several generals who she claimed retired early from the military "because they told President Obama things that he didn't want to hear." One of the generals she named, David Petraeus, resigned as director of the Central Intelligence Agency after an investigation turned up evidence of an extramarital affair with his biographer, and another general, Stanley McChrystal, was fired by Obama after his aides were quoted in a magazine article mocking Vice President Joe Biden and other officials. Politico noted that Paul was off base in claming that "every terrorist attack we've had since 9/11 has been [from] legal immigration." The U.S. Army psychiatrist who killed 13 people at Fort Hood, Texas, in 2009 was an American, as was Syed Rizwan Farook, who with his Pakistani wife attacked a municipal workers' holiday party in California earlier this month, killing 14 people.